1. 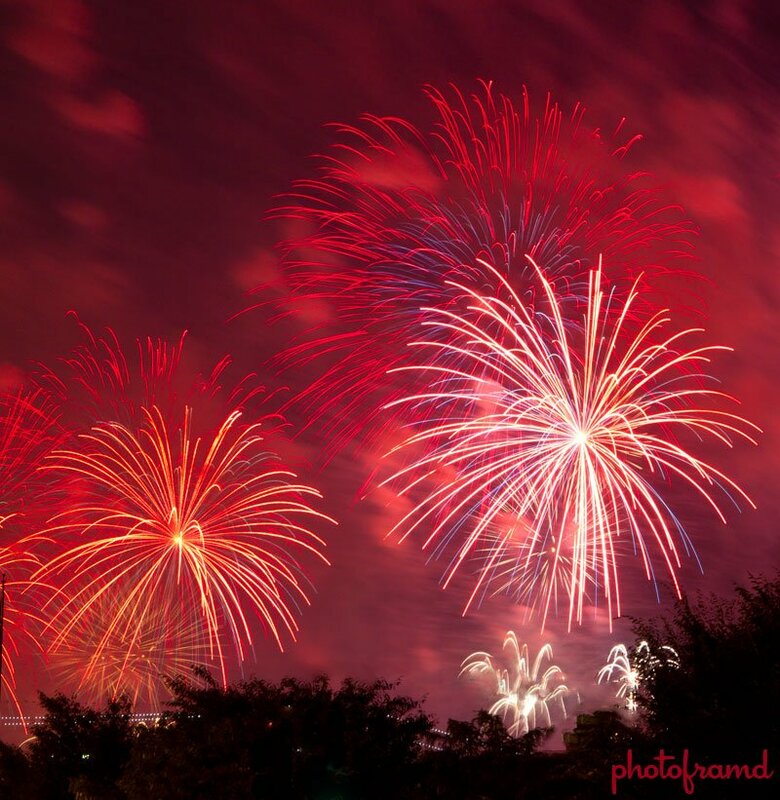 Find the best location: Fireworks can be photographed from almost 360 degrees. Try to find a spot with an unobstructed view away from the crowd. Try to get as close as possible to the viewing area. Otherwise,you can include the surrounding environment like water,reflections,etc. for atmosphere. Try not to be downwind of the fireworks. After a few minutes,a smoke cloud will build at the fireworks site and begin to travel with the wind. Try not to have excess light behind your camera or in view. You want to focus exclusively on the fireworks without any other light (light polls,traffic lights,cars,homes,buildings,etc.) polluting the scene. Use a lens hood! A wide-angle zoom or telephoto zoom depending on your proximity. A zoom will give you better leeway with your shot. Don’t worry if you are including too much dead-space around the bursting fireworks. Since the bursts will vary in height and size,it is better to capture the entire burst. You can always crop it tight later. An empty media card and a fully-charged battery. A flashlight in case you need to check your equipment. 3. Check your camera settings: The drama is in the event not just a single burst. A long exposure lasting several seconds works the best. Put the camera on a tripod. Be careful not to kick it or have bystanders get in the way. Set the camera on a bulb setting using the cable release/remote. Bulb setting will allow you to manually control the start and the end of the time-lapse shot. Fireworks are set off in a wave. Press the shutter just after you hear the first shot and hold the shutter until it trails off. If your camera does not have a bulb setting,set it for a long exposure. A slow shutter of 4 to 6 seconds will work. Use a small aperture like f/8 or f/16 depending on how long you want to expose the image. The longer the exposure the smaller the aperture (ex. f/22 with an 8 second exposure). If your camera has a Shutter-Priority mode,you can let the camera set the Aperture. That’s the easiest way! Manually set the ISO to a low setting like 100. This is an extended shot and you want to minimize the noise. Set the camera on manual focus and focus for Infinity. Be sure your flash is turned off. Shoot Raw! You will have more latitude afterward to perfect the image. 4. Look at the crowd: remember to periodically look at the crowd for some possible candid shots. If you have a second camera,use it! This way your primary camera stays on the tripod with all the settings intact and you are free with the second camera to capture the crowds reactions! Try the camera in that fancy new smartphone for crowd shots. 5. Multiple Bursts on same exposure: if you have a camera with a bulb setting and a cable release with a lock,you can leave the shutter open for an extended period of time. You can capture multiple bursts onto the same image by exposing your first shot with the lock in place and then covering the lens with a lens cap (or even a baseball cap,bag,cardboard,etc.) to pause in-between bursts. Be sure to use a very small aperture (ex. f/16 or higher). Be careful to minimize the camera movement. 6. Plan on taking many shots: a fireworks display can last for 15-minutes or much longer. You will have many chances to get the right shot. Experiment and have fun! 7. Afterwards: In Photoshop or Camera Raw,adjust the Levels to set the night sky to pure black. In Lightroom, you will need to adjust the Blacks in the Tone Tab and the Darks/Shadows in the Tone Curve Tab. Making these adjustments will really make the fireworks POP! Most important – stay safe and have a good time! I will post my shots next week.